In this retired couple’s dream home, automation is elementary. Punta Gorda, Florida: here, the living is easy. Throughout the neighborhoods near Charlotte Harbor, a network of canals ensures that everybody can park their boat behind their house, and have access to the Gulf. It’s the kind of place retired folks come to live the good life…perhaps none as much as one couple—the owners of a smart home decked out with one serious centralized lighting system. These owners removed three houses from adjacent properties to build their home at the end of a cul-de-sac, so they would be nearly surrounded by water. The owners (who wish to remain anonymous) had one vision when designing their house: “the concept was light, bright, and fun,” notes the husband. In 2010 they started building, and from the very beginning, home automation was a part of the plan. “We knew, in a house of this size—ten thousand square feet—we were going to have a lot of lighting,” he continues. Both the husband and wife had noticed that at the homes of many of their friends, the electrical system and lighting panels were overly complicated. With a background in electrical engineering, the husband knew that panelized lighting was the only way to incorporate complex lighting options while maintaining the clean and sleek décor he and his wife wanted in their interior design. The homeowners chose Barry Dorsey with Armor Systems to install the automation system. “This gentleman wanted to have the home of his dreams,” Barry says. Initially, the homeowner tested Barry on his technical knowledge, without letting on that he had a background in electrical engineering. “Barry and his people were very technical though,” the owner remarks. “They did a great job, we communicated very well together. He really knew his stuff.” Barry helped design a complete Control4 panelized lighting system that packed enough power and versatility to respond to the tech-savvy owner’s desires. “He wanted state of the art, and wanted to be able to have fun with it too,” Barry continues. Barry and his team worked together with the builders and the interior designer to transform the vision into a reality. “Everybody worked together, everybody was a team,” he notes. And while the husband is a self-admitted tech geek, the wife definitely is not. “When she pushes a button, she just wants it to work,” says Barry. The Control4 light switches work on many levels. The top button (featuring a blue light) always turns on the main lights in whatever room you’re in. When a light is on, a green light next to that button lets you know it’s on. When you leave a room, the bottom button is always the “ALL OFF.” Beyond that, the options are limitless. Several rooms feature scenes that control not just the lights, but music, televisions, and more. And then there are the customized scenes. “At nighttime when I come home, I push “HOME,” it lights up a path for me from one end of the house to the other,” the owner notes. “That’s probably my favorite feature. You could never do that without a smart home system.” He and his wife also love the “WELCOME” feature—at night when the doorbell rings, they can hit “Welcome,” and the front area of the house (inside and outside) light up to greet visitors. The owner’s wife has her own favorite features. “It’s a party house,” she explains. “The best part is, we can have every light in the house on, and when the party ends, I can hit one switch and all the lights in the house go off. I don’t have to run around to every room.” Ever social, this couple can host a pre-party, stop at the back door on their way out, hit “HOUSE OFF” and they’re on their way to the next soiree. Sign up to learn how to make your home smart. Sign up below to receive more information. 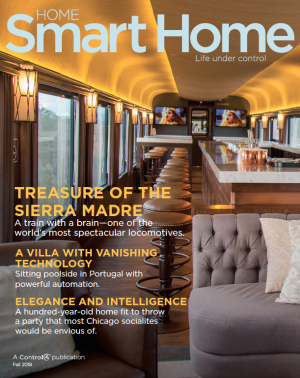 Home Smart Home is the magazine that brings you the latest trends in home control solutions and smart devices.